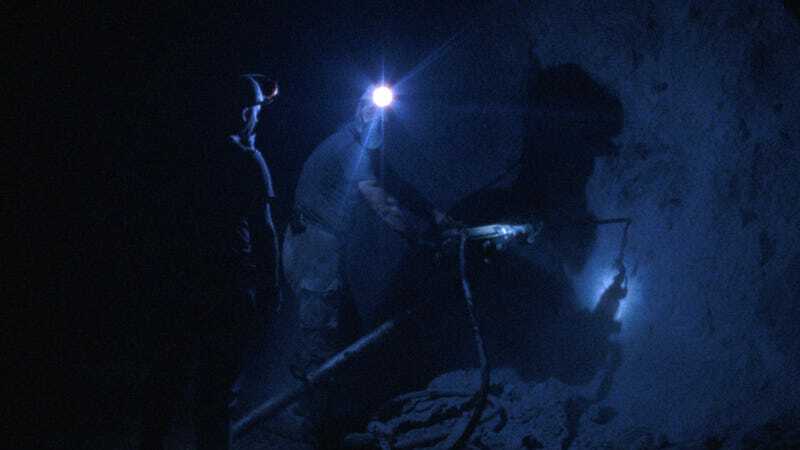 The close proximity of mining and myth is one of the starting points of Good Luck, a documentary by the peripatetic avant-garde filmmaker Ben Russell in two parts, each long enough to be its own stand-alone feature: the first shot deep in the bowels of an industrial copper mine in Serbia, the second at an illegal gold panning operation in Suriname. Another starting point is the insight that can come from double meanings and relationships between antipodes—the cartoon trope of a character digging to China, which ironically seems to have entered American popular usage from Henry David Thoreau’s proto-environmentalist Walden. Russell is presumably the digger; among the many self-reflexive subtexts here is an analogy between extracting precious metals and filming trippy ethnographic non-fiction. A cryptic glyph that appears at the beginning, middle, and end appears to sum up the whole project: a halved circle, representing not only two subjects on opposite sides of the world (figuratively, if not quite geographically), but Russell’s underlying vision of a humanity separated by its shared experiences. The first part is terrific and transfixing. Working in transportive long takes, Russell achieves some nearly miraculous effects—notably, a shot that prowls down a sloe-black mine tunnel to land in close-up on a jackhammer—as he blends the plutonic and the Platonic: the underworld and the allegory of the cave. There’s something about the beginning of cinema in there, too. The Serbian miners’ headlamps cut ovals into the darkness, redolent of spotlights, the fuzzy vignettes of early photography, or an illuminating point-of-view. (For longtime watchers of Russell’s work, this will probably recall the short Black And White Trypps Number Three, one of his best early films, which literally cast a light on the mosh pit of a Lightning Bolt show.) Occasional black-and-white portrait shots of miners draw another link to early film. But then, they are also reminiscent of Andy Warhol’s mid-1960s Screen Tests series, a kind of pop-art glamour. Russell’s choice of format is itself an oldie-but-goodie: Super 16mm, a practical option, considering that digital cameras don’t do well in extreme conditions. Like any clever artist, he turns the limitations of his photochemical medium into poetic qualities; riding with miners on a long trip back up to the surface, his camera appears to simply run out of film, punctuating their extreme isolation. Pitch darkness has a texture on grainy film that translates into an uneasy presence when combined with the movement of the camera down sloping tunnels and around corners. The opening note is one of loss, as a brass band warbles through into a village on the edge of the gargantuan maw of an open pit mine. At work, the miners themselves have a zombie quality: Anonymous in their respirators, hard hats, and coveralls, they shamble mysteriously to their shifts. Somewhere in there, a miner’s Herzog-ian accordion rendition of “Heart Of Gold” echoes through a cavern. It’s obvious, but somehow it works. The Suriname-set part presents a set of opposites: tropics and open vistas instead of tunnels, prospecting instead of corporate labor, sunlight instead of darkness. 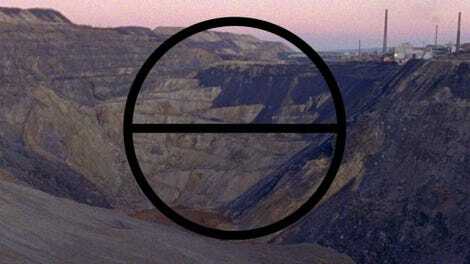 The dominant color is muddy red, in contrast to copper mine’s otherworldly blues, and the first scene is one of solitary discovery, as a man traipses around with a metal detector, a pickax tucked into the back of his T-shirt. Russell shot his debut feature, Let Each One Go Where He May, in Suriname, and his familiarity with the tiny South American country marks a change in tone. These miners are individuals; we can actually see their facial expressions and tell them apart as they toil. But there are parallels, too, in the camaraderie and superstitions of the profession and in its mix of sweaty labor, deafening machinery, and bored downtime. Not that Russell ever spells it out. His work, which is in part about exploration, is paced to draw the viewer into its interpretations, its conclusions, its mysticism. But without the innate suspense of the film’s 70-minute underground passage, the second half quickly grows repetitive. Out in the daylight and above ground, the ironies are louder: the poor mining the most valuable. Maybe there’s a message buried in there, too—that the poetry of the first part is a sort of stupefying darkness, obscuring what is really just a dirty job that people do to get by.